Streak-Free – Our 100% streak-free glass cleaning spray is designed with a no-residue formula to eliminate the haze that other leading glass cleaners can sometimes leave behind. No Ammonia- Perfect Glass is ammonia-free. This ensures that the product still delivers high performance that’s safe safe on tinted and tint film windows. Safe for Device Screens – Our streak-free glass cleaner is great for all or most of your “screens”. Just be sure to spray the cloth and then wipe the surface, rather than spraying directly on the device. Details: Hope’s Perfect Glass was developed for those frustrated with the haze and residue other glass cleaners can leave behind. Hope’s 100% streak-free formula uses high quality ingredients to help reduce cleaning time and maximize efficacy. Additionally, it’s ammonia-free so it’s safe on tint film and tinted windows. 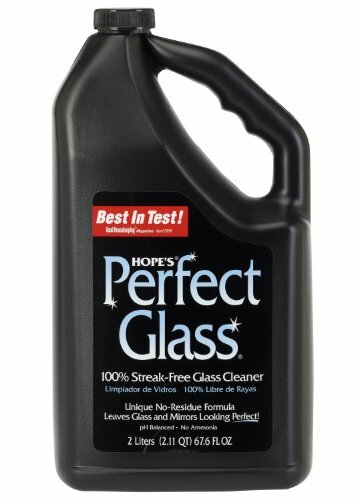 In testing by a leading consumer magazine, Perfect Glass was rated the top performing glass cleaner. Great for multiple surfaces, such as windows, mirrors, windshields, device screens, tabletops and more. Hope’s Perfect Glass is Made in the USA.